"He just couldn't believe his eyes. As if he didn't believe it was real life." 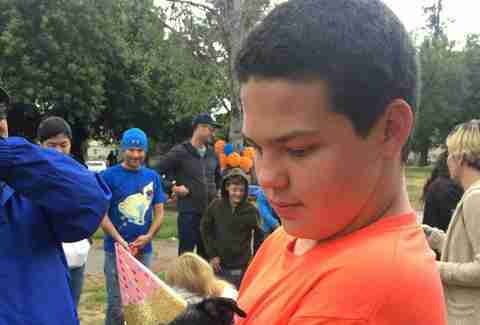 Andrew is a 14-year-old boy with autism, and his favorite thing in the entire world is pugs. When he was little, Andrew didn’t have a lot of friends, and so he created a cast of imaginary friends to hang out with — who, for some reason, all happened to be pugs. Andrew’s family has always lived in places where dogs aren’t allowed, and so he’s never been able to have a pug of his own. His obsession has stayed strong throughout the years, though, and he owns a ton of pug-themed things, including backpacks, T-shirts, a wallet and keychains. As Andrew’s 14th birthday approached, his sister wanted to do something special for him, and soon came up with the idea for a pug-themed party. Little decided to make a Facebook post asking her friends if anyone had a pug they could bring to Andrew’s party to surprise him. She desperately wanted to make this birthday special for her brother, especially because he’d never had a birthday party before. 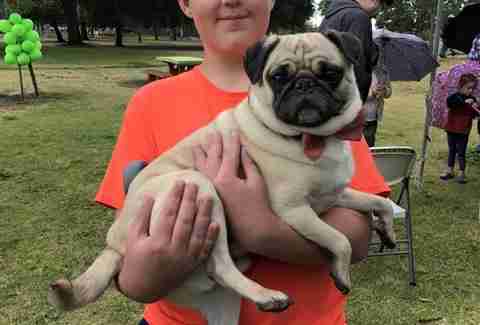 Little’s friends began to share her post, in hopes of finding someone who had a pug who would be able to attend Andrew’s party. 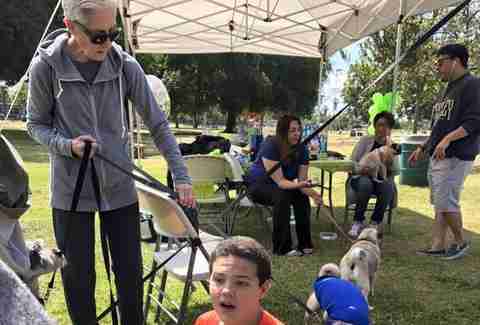 Three days before his birthday, no one with a pug had RSVP’d yet — and then something amazing happened. 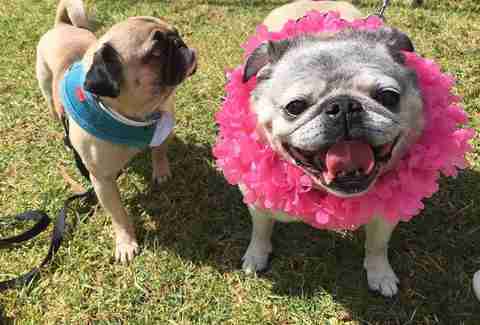 Pug Nation Rescue of Los Angeles heard about Andrew’s party and wanted to help. The group shared the party event on its Facebook page, hoping that some of its followers would be able to attend. 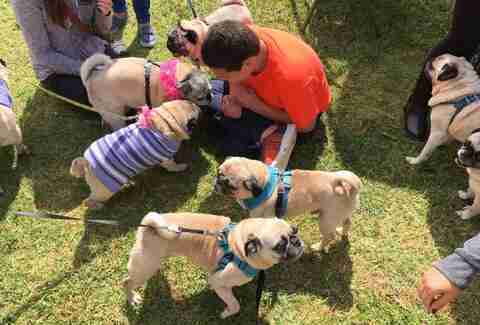 Within a few hours, over 50 people and their pugs had RSVP’d for Andrew’s special day. Finally, the big day arrived. 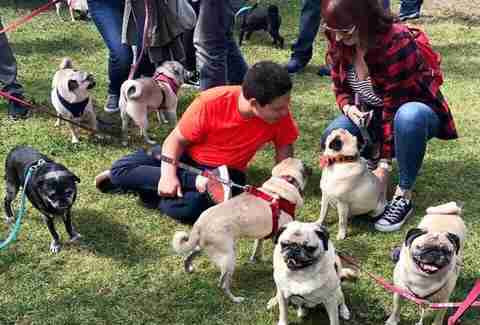 When Andrew and his family showed up at the park for his birthday party, there were 15 pugs waiting to surprise him. Over the course of the party, over 80 different pugs and their owners came by, all eager to spend time with Andrew and wish him a happy birthday. For most of the party, Andrew just sat in the grass watching all of the pugs running all around him, reaching out to pet them whenever they came close. He had a look of pure joy on his face the entire time, and loved every single pug he met. Andrew and his family are so thankful to every person and dog who attended his birthday party. 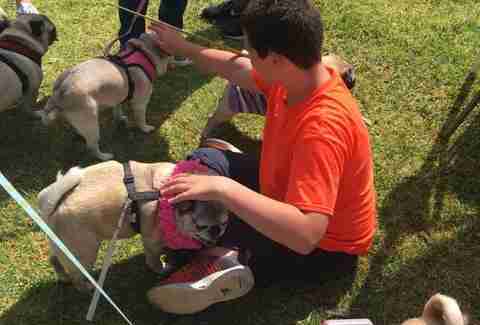 Andrew doesn’t always feel accepted by kids his age, but this year on his birthday he had all the love, friends and pug kisses he could ever ask for. “He told me it was the best birthday he has ever had and that he wants to do this every year,” Little said.